As part of the outstanding DogSmith of Estepona team, Certified Pet Care Technician and assistant trainer, Janina Tainio loves helping dogs ‘become family’, so, who better to entrust with the care and education of your beloved four-legged family member? As an advocate of a positive, fear-free approach to pet care and training, Janina helps dogs be the best companions possible. 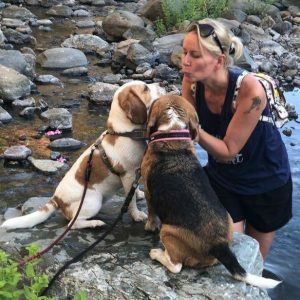 All the canine clients Janina works with get the same love, personal attention and extraordinary professional expertise that she gives her own dogs – two gorgeous Beagles, Minni and Iines. Janina’s pet care technician certification involved rigorous academic and practical training in dog communication, pet first aid and tools, equipment and toys. Never one to rest on her laurel’s, Janina continues to improve and maintain her professional expertise through a series of continuing education programmes and practical hands-on experience. In addition to Janina’s credential as a Certified Pet Care Technician, she is also a fully qualified Fun Scent Games Instructor. Janina is a native of Finland and speaks Finnish and English. Come join the fun and get the solutions you need at the DogSmith of Estepona! We look forward to helping your pets become family!